Ataluren (PTC124) selectively induces ribosomal read-through of premature but not normal termination codons, with EC50 of 0.1 μM in HEK293 cells, may provide treatment for genetic disorders caused by nonsense mutations (e.g. CF caused by CFTR nonsense mutation). Phase 3. Effect of systemic ataluren treatment on mice with the Pax6Sey+/- phenotype. The black arrowhead indicates the lenticular stalk; the black arrow indicates the cornea; and the asterisk indicates the ciliary margin. WT, Pax6+/+; Mt, Pax6Sey/+; L, lens; r, retina. Original magnification, x5. 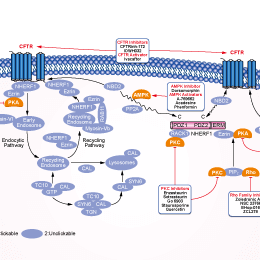 CFTRinh-172 is a voltage-independent, selective CFTR inhibitor with Ki of 300 nM, showing no effects on MDR1, ATP-sensitive K+ channels, or a series of other transporters. IOWH032 is a synthetic CFTR inhibitor with IC50 of 1.01 μM in CHO-CFTR cell based assays. Phase 2. GlyH-101 is a selective and reversible CFTR inhibitor with Ki of 4.3 μM. Ivacaftor (VX-770) is a selective potentiator of CFTR targeting G551D-CFTR and F508del-CFTR with EC50 of 100 nM and 25 nM in fisher rat thyroid cells, respectively. (A) CFTR Western blot of normal (NL) and CF HBE cultures treated with VX-809 (5 uM) ± VX-770 (5 uM) for 48 hours. “*” indicates the mature, complex glycosylated form of CFTR, band C; “•” indicates the immature band B. (B) Turnover of rescued ΔF508 in BHK-21 cells. ΔF508 was rescued at 27°C in the presence of VX-809 ± VX-770 for 24 hours. After adding cycloheximide (200 ug/ml, 37°C), cells were lysed at the indicated times and analyzed by Western blotting. GLPG1837 is a novel CFTR potentiator with an EC50 value of 3 nM for F508del, showing enhanced efficacy on CFTR mutants harboring class III mutations compared to Ivacaftor. VX-809 (Lumacaftor) acts to correct CFTR mutations common in cystic fibrosis by increasing mutant CFTR (F508del-CFTR) maturation,EC50 of 0.1 μM in fisher rat thyroid cells. Phase 3. RAF1 and CAMKK1 single siRNA validation in flow cytometry. RAF1 and CAMKK1 single Dharmacon ON-TARGETplus siRNAs with or without VX-809 treatment. Measured surface CFTR fluorescence with a BD Accuri flow cytometer with Intellicyt HTFC. The grayed out region represents VX-809s average surface fluorescence. VX-809 + siRNA significance is shown from VX-809 negative control. Data are shown as mean ± SEM (3−4 replicates). One-way ANOVA with multiple comparison for significant changes from VX-809 neg. ctrl (0 nM) (red P-values). ***P ≤ 0.001; **P ≤ 0.01; *P ≤ 0.05. Tezacaftor (VX-661) is a second F508del CFTR corrector and is believed to help CFTR protein reach the cell surface. Phase 2. (B)ΔISC response to forskolin observed in VX-661-treated CF HBE cells (*P = 0.0021, VX661 vs. vehicle) was prevented by chronic VX-770 treatment and significantly different from VX-661-treated cells (#P=0.0126, VX661 vs. VX661+VX770). (C) The response to CFTR inh-172 that was observed in VX-661-treated cells (*P = 0.0111, VX661 vs. vehicle) was significantly decreased in VX809+VX770 treated cells (#P = 0.0038, VX661 vs. VX661+VX770). Primary CF HBE cultures (ΔF508/ΔF508) were derived from 3 different patients, and 3-4 replicates were performed per patient.